Performers include: Diane Kruger, Demián Bichir, Annabeth Gish, Thomas M. Wright, and Ted Levine. This crime thriller explores the tensions on the U.S. – Mexico border. 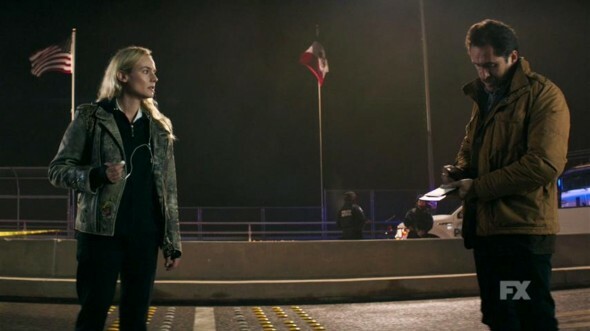 When an American judge known for her anti-immigration views is found dead on the bridge that connects El Paso and Juarez, Sonya Cross (Diane Kruger) from the El Paso Police Department must work with her Mexican counterpart from Chihuahua State Police, Marco Ruiz (Demian Bichir). Their goal is to catch a serial killer operating on both sides of the border. Marco understands the slippery politics of Mexican law enforcement. While his police force slowly succumbs to the pressures and demands of the cartel, he’s one of the last good men in the department. He’s charming, but also cunning as he will do whatever it takes to get what he needs. This doesn’t sit well with Sonya, who has Asperger’s and strictly follows rules — as well as protocol. Her candid and off-putting personality fuels an unforgiving drive for truth. The case quickly pulls them both into a string of murders on the border, a scene already consumed by illegal immigration, drug trafficking, violence and prostitution. Marco’s loyalty is put to the ultimate test while Sonya attempts to tie up loose ends. Eleanor yearns for closure. Frye and Adriana land an insider source. What do you think? Do you like the The Bridge TV series? Do you think it should be cancelled or renewed for another season? Too close to home, this series was right on the money. I live in El Paso no more than thousand feet from the border. Late night I would hear people coming across the Rio Grande River from Juarez. I love this show. I think it should come back so people are aware what is going on in the homeland.